as gain, input impedance, output impedance and bandwidth. Instruments & Components:- Computer with Simulation tool Microcap. Fig. shows the basic CE circuit with voltage divider biasing. Emitter is at ground potential hence the name common emitter. The signal from the signal source is coupled into the base of transistor through coupling capacitor C1 which provides dc isolation between amplifier and signal source. The dc transistor biasing is established by R1 and R2 and is not disturbed when the signal source is capacitively coupled to amplifier. operating point. The capacitor CE is used to allow the AC to bypass RE. 2) RC is collector resistor used for controlling the collector current. conditions. Thus presence of CE does not the dc biasing conditions. and passing only the ac part of amplified signal to the load. 3) Internal capacitances of the BJT. 1) The capacitor C1 and C2 are coupling capacitors used for blocking the dc Part and allowing only the ac part of the signal to pass through. They can replace by short circuit. 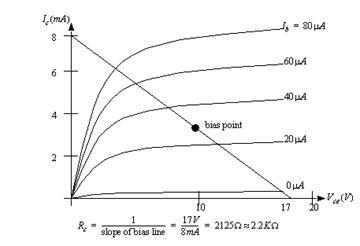 3) A low frequency however the reactance of coupling capacitance will be large. Due to this the voltage drop across them increases with reduction in frequency. This increased voltage drop will reduce both the output and gain of the amplifier in the low frequency region of frequency response. 1) At medium and high frequency the bypass capacitor Ce offers a very low reactance. Therefore it can be replaced by a short circuit. Therefore the impedance ZE which is parallel combination of RE and Xce will have a zero value. Thus RE is bypass successfully and the bypass capacitor CE has no effect on the frequency response of the amplifier at medium and high frequency. 2) But at low frequencies, the reactance Xce is not equal to zero but it has some finite value. Thus the parallel combination of RE and Ce will offer finite impedence.So Re is not properly bypassed. 4) So if RE is not properly bypassed then the voltage gain will decrease. With these values of R1 and R2 connect the circuit as shown in fig and simulate it. 1) Perform the dynamic DC analysis and observe the node voltages and node currents. 2) Measure VCEQ , VBEQ, ICQ and compare the values with designed values. Disconnect 1K resistor and Connect 10k resistor across the output and measure output Voâ€™â€™. Calculate Ro=[(Vo-Voâ€™â€™)/Voâ€™â€™] X 10k.